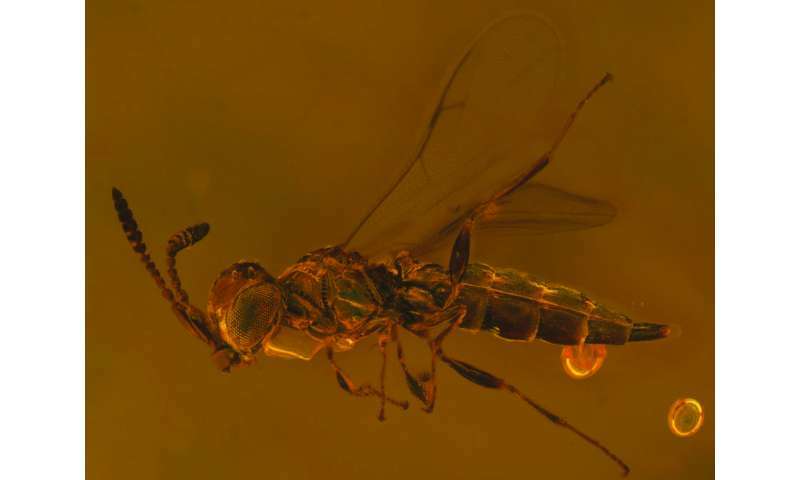 During her study on fossil insects of the order Hymenoptera at China's Capitol Normal University, student Longfeng Li visited the Smithsonian National Museum of Natural History, Washington, carrying two unidentified wasp specimens that were exceptionally well-preserved in Burmese amber. This type of fossilized tree resin is known for the quality of the fossil specimens which can be preserved inside it. Being 100 million years old, they provide an incredible view into the past. The subsequent analysis of the specimens revealed that both represent species new to science. 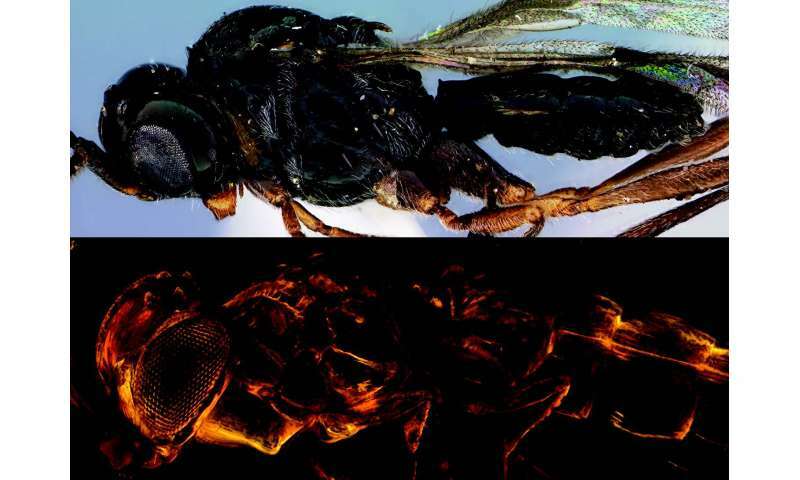 Furthermore, one of the wasps showed such amazing similarities to a modern group of wasps that it was placed in a currently existing genus, Archaeoteleia which has long been considered as an ancient lineage. The species are described in a study published in the open access Journal of Hymenoptera Research. However, Archaeoteleia has changed since the times when the ancient wasp got stuck on fresh tree resin. The authors note that "a novice might not recognize the characters that unite the fossil with extant species". For instance, the modern wasp species of the genus show visibly longer antennal segments and a different number of teeth on the mandible when compared to the fossil. In turn, the description of the new extinct species enhances the knowledge about living species by highlighting anatomical structures shared by all species within the genus. This fossil wasp with living relatives received quite a curious name, Archaeoteleia astropulvis. The species name, astropulvis, translates from Latin to 'star dust'. The discoverers chose the name to refer to both "the ancient source of the atoms that form our planet and its inhabitants", as well as to commemorate the late David Bowie's alter ego - Ziggy Stardust. 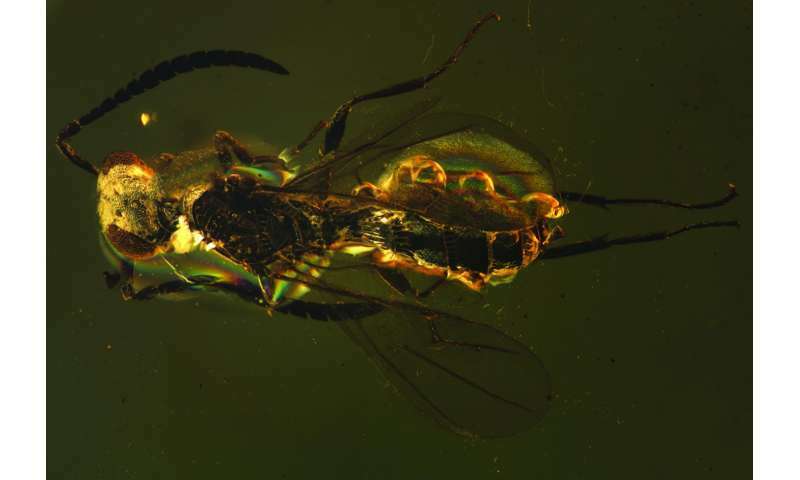 Unlike the Star dust wasp, the second new species belongs to a genus (Proteroscelio) known exclusively from Cretaceous fossils. Likewise, it is a tiny insect, measuring less than 2mm in length. It also plays an important role in taxonomy by expanding the anatomical diversity known from this extinct genus. The authors conclude that their discovery, especially the Star dust wasp and its placement in an extant genus, where it is the only fossil species, "exemplifies the importance of understanding the extant fauna of a taxon to interpret fossils". "Such union of fossil and extant morphologies is especially illuminating and requires examination of both kinds of specimens," they add.